Here’s an idea I’ve been brainstorming recently, and which I’m tossing in a rather raw form out into the world: has anyone written the definitive typology of different types of political disputes? Not that I plan to write it; I’d just like to know if it’s out there! 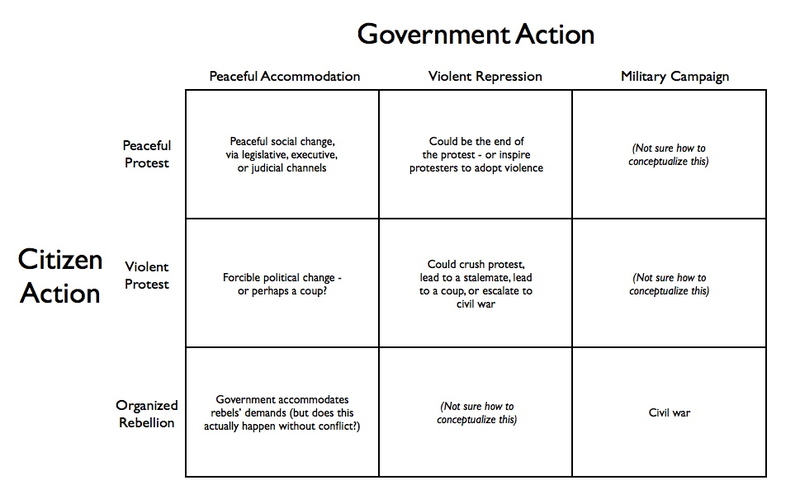 Consider the ways in which citizens may express opposition to government policy. This could run the spectrum from peaceful protest to violent rebellion on the civilian disputant side, and from active accommodation to a violent military campaign on the state side. Naturally, such disputes are relational and contingent – the actions taken by either party provoke a reaction of some type by the other party, which itself will condition future actions by the first party. I was thinking of this because most of the work I’ve seen on African politics in the 1990s seems to focus rather narrowly on either pro-democratic protest or civil war, without considering them as examples of political dispute on different ends of the same spectrum. Some of this literature is discussed in my recent post on Robert Bates’ latest book. As I noted in that post, the same combination of factors (economic stagnation + political unrest) led to fairly peaceful democratic change in some countries and civil war in others. I’m not asking here about why some countries consolidated democracy and others reverted to authoritarianism or fell into conflict; the income hypothesis seems to predict democratic consolidation pretty well. And I’m not asking about why some countries had civil wars at all and others didn’t; there’s a lot of work out there on the structural determinants of civil war, notably Collier & Hoeffler. But I do think it’s interesting that, facing similar sets of political disputes around the same time (the 1980s and early 1990s), some countries followed contingent paths that led to relatively peaceful political change, whilst others drifted towards the use of violence. As a first take at an organizing structure for this thought, here’s a graph representing the spectrum of citizen & government positions during a political dispute. (Click to enlarge it.) It clearly still needs some work. Does anyone find this useful? Am I just replicating someone else’s work without knowing it? (It looks like Gina Bateson at Yale has a working paper addressing a similar topic, but I haven’t seen much else about the relational, contingent nature of political conflict.) Would love to hear your thoughts, oh readers! I think you’re getting stuck trying to frame this as a typology when it’s really a dynamic and interactive process. For one smart attempt to discuss why these interactions might go in different directions under similar circumstances, see this 2005 paper by Pat Regan and Daniel Norton: http://jcr.sagepub.com/content/49/3/319.abstract. Thanks for your comment and the link to Regan & Norton, Jay! I definitely agree that it’s a dynamic and interactive process, and realize that I didn’t explain how that would connect to a framework of typologies in the post. Writing a follow-up post now that will incorporate this point.